Singapore could cooperate with India to develop a 'little Singapore' along the Delhi-Mumbai Industrial Corridor under the new government's 100 smart cities project, this was conveyed by External Affairs Minister Sushma Swaraj to top leaders. The External Affairs Minister, who arrived here late last night along with senior officials of her Ministry, held a series of meetings including with Prime Minister Lee Hsien Loong. During her meetings, Swaraj briefed the Ministers about her government's plan to build 100 smart cities. Apart from calling on the Prime Minister, Swaraj held talks with her Singaporean counterpart K Shanmugam and also called on former premier Goh Chok Tong. 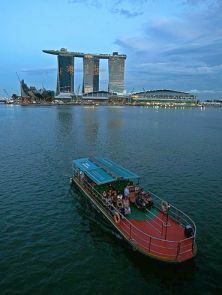 On its part, Singapore has expressed keenness to cooperate with India in specific areas of its expertise like water management and urban rejuvenation, officials said. In the budget, the new Indian government had proposed to develop 100 'smart cities' as satellite towns of larger cities and allocated Rs 7,060 crore for the ambitious project. The Government has proposed to develop the smart cities to take the load off from the mega cities. It is estimated that by 2051, half of India's population would reside in urban settlements with contributions of 75-80 per cent to the GDP. Smart City uses technology to transform its core system through the use of Information and Communication Technology (ICT) to optimise best use of its finite resources. Under smart city project, government plans to use innovative mobile and communications technology for efficient delivery of public services and management of water, waste, energy, health, transport and public infrastructures. India's collaboration with Singapore for Smart Cities could cover various aspects such as use of IT in management of cities, public affordable housing, use of new technology for sewerage treatment including solid waste management, urban management for conservation energy use and transport planning.